More and more EA modellers are downloading Archi and getting up to speed with ArchiMate. We’re seeing around 1500 downloads of the tool every week. Because end user uptake is so high, and because Archi is so ubiquitous, we’re also learning about a greater number of developers and start-ups building services and providing solutions based around ArchiMate tooling and online EA and ArchiMate model repositories. The basic pattern for these solutions generally consists of an ArchiMate enabled desktop client importing and exporting models to a repository, via a web interface, using the tool’s native file format or the ArchiMate File Exchange Format. These repositories form the core of further EA services such as online editing, asset management, reporting, querying, dashboards, and visualisations. Some of these solutions providers have contacted me to tell me that they are now provisioning Archi as the editor and connecting it to their repositories via their (commercial and free) interfaces. Whereas before they used to provide a package consisting of a recommended commercial desktop client software, together with their consultancy and custom repository to customers, solutions providers are now recommending Archi as the front-end editing tool on the desktop. One of the reasons for this is cost. Passing on the expense of several commercial licences for third-party tools to the customer is proving to be non-viable. Right now, we’re exploring possibilities for distributing the integration between Archi on the desktop and some providers’ repository solutions within Archi itself, either as custom plug-ins or via a new API. This will naturally lead to even more usage of Archi, ArchiMate and the ArchiMate Exchange Format, once again fulfilling J-B Sarrodie’s vision of “Archi Everywhere” or, to re-purpose (for better) the recent Twitter hashtag, #MAGA, “Make ArchiMate Great Again”. I didn’t take this concept any further for various reasons, and I may not need to now. If a model repository provider can offer both paid for and free service plans, like those provided by GitHub, BitBucket and the like, then we might reach the point where their offerings scale to all levels of user requirements – free tooling on the desktop, free integration with online repositories and free provisioning, while additional paid-for services would fulfil advanced and commercial requirements – private repositories, support, dashboards, collaboration, and so on. 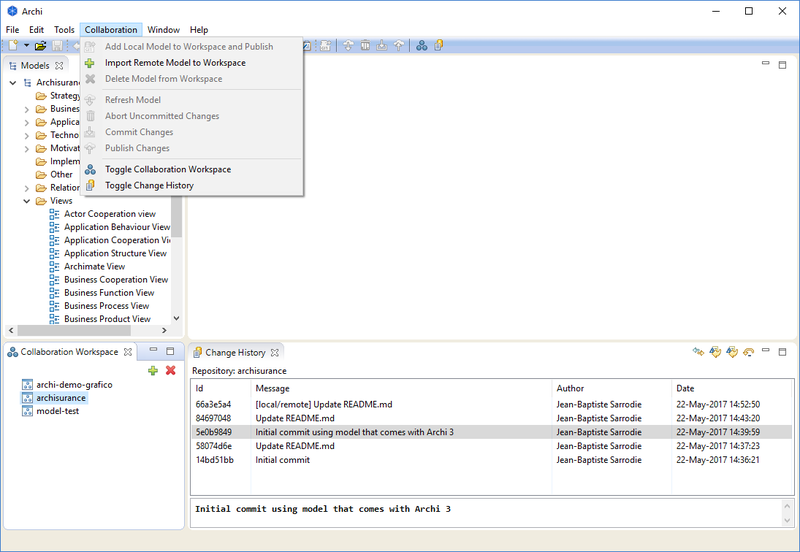 Another model repository alternative that you can use today is the Archi Collaboration Plug-in, a Git-based solution that allows users to collaborate on Archi models in a distributed way. Just like Git, no single central repository is required and users can work off-line. This was the brainchild of J-B Sarrodie, and development was funded by Arismore and the French governmental agency, Pôle Emploi. We are still actively developing and promoting the plug-in, and it was very encouraging for J-B and I to receive very positive feedback from Archi users at The Open Group’s conference in Amsterdam last month. Several people told us about how they are using it in actual deployment. I wrote about the plug-in earlier this year, and you can find out more about it over on the Archi Plug-ins web page and on GitHub. 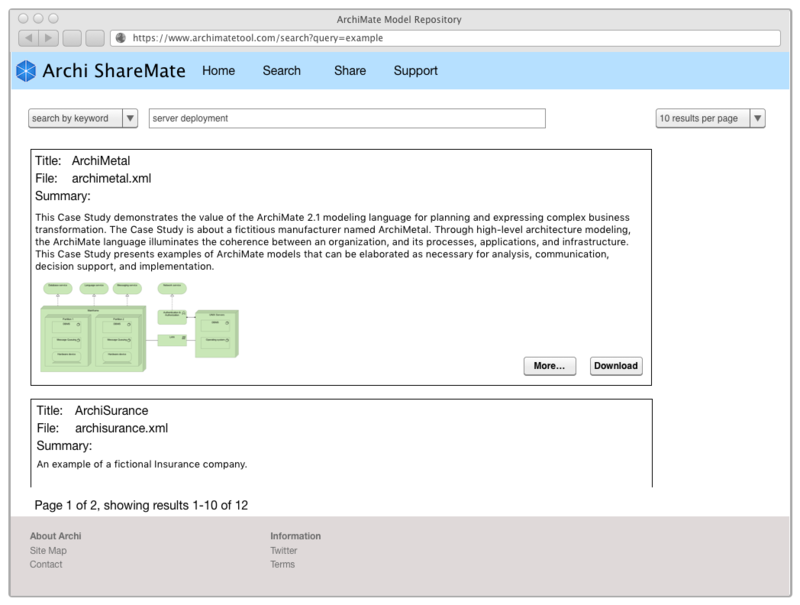 So, that’s a quick round-up of several new developments involving Archi, the ArchiMate Exchange Format, and online repositories. The Archi collaboration plug-in is being used now, and several other third-party repositories and solutions that use Archi as the client are also available, and you can find them online should you wish to pursue this.